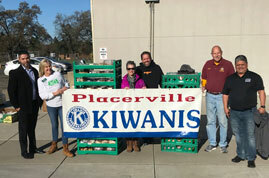 Placer Food Bank generously delivers pounds of food to the Green Valley Community Church for Kiwanis members to organize into large boxes for families in need. Left to right: Jorge Lupercio (Placer Food Bank), Jean Meyer (Kiwanis), Mary Shoenberger (Placer Food Bank), Rick Van Scoy (GVCC), Carl Hagen (Kiwanis), and Dave Martinez (Executive Director of the Placer Food Bank). More than 50 families in need received a visit from Placerville Kiwanis Club members and a large box of food and other items to help them enjoy the month of December. Kiwanians began December 6 gathering pounds of food and boxes donated by Placer Food Bank and Boa Vista Orchards at Green Valley Community Church (GVCC). After they assembled the food and supplies, everyone jumped in to help weigh, sort food, and organize the boxes in trucks for drop off routes. David Ashby, Executive Director of New Morning Youth & Family Services and Kiwanis Club member, worked with other community agencies to identify those families that could use some extra help during the holiday season. The Placerville Kiwanis Club was chartered in 1956 and has grown to include many unique individuals, business owners, local agencies, and elected officials. Members collectively volunteer more than 3,000 hours every year in a variety of school and community causes, including Academic Decathlon, Easter Egg Hunt, City of Placerville Fishing Derby, and much more. Money raised through their annual Pasta Feed and Studebaker Wheelbarrow Races help support six high school scholarships and the Central Sierra Regional Occupation Program for Culinary Arts. Throughout the year, Placerville Kiwanis facilitates three high school Key Clubs (Ponderosa, Union Mine, and El Dorado High Schools), the Markham Middle School Builders Club, and the AKTION Club of El Dorado County. Key Clubs include student members who volunteer for activities like maintaining the Kiwanis Family House which provides lodging for family members whose loved one is being treated at Shriners Hospital for Children or U.C. Davis Medical Center in Sacramento. For questions and information about how to become a member or visit a meeting, contact info@placervillekiwanis.org or call Carl Hagen at (530) 957-0149.